Metrics and Methods for On and Offline Success, so goes the subtitle of this book. This is a fantastic piece of work by Akin, who I have known for quite some time – since the early days of eMetrics. What’s so good about this book? Well, this is a tough space to write for, this seam where Marketing and Technology meet. There’s an audience on either side and you’re writing down the middle. Akin has done a great job producing a work that should have both sides paying attention and hopefully will provide a platform for better communication with each other. The framework he chose for the book is a brilliant approach. First, a dissection of Online, Direct, and Brand Marketing. What are the metrics and methods that drive each of them? How is each of these Marketing disciplines handling the multichannel challenge within their own silos, and what are they probably missing because of silos? This first part of the book I think will be widely appreciated, especially on the Technology side, for laying out in a logical way what the various Marketing factions are up to, why they do what they do, and how they look at measurement. I find in the web space particularly lots of people have 1999-era notions of what “Measuring Marketing” is. Akin provides really great background here, lots of detail on where the various measurement approaches come from and how they are used. This Online, Direct, and Brand Marketing structure becomes the backbone of the book, it continues throughout the entire work and provides the reference point, the base for understanding. Very smart idea, it brings everybody to the party. In Part 2, Akin looks at why the various factions should be sharing their metrics and methods, how fusing the various multichannel measurement approaches developed by Online, Direct, and Brand Marketers results in a whole better than the sum of parts. This section really digs into which metrics and measurement approaches are best for different situations and levels of available data. I really like this “cascading” approach to data. Got a little data? Look at measurement this way. Got more data? Think about measurement this way. Got a ton of data? Here’s the best way to look at measurement. This section really gets into the whole control group issue, and why, if you can, you should Measure Customers, not Campaigns, to determine your success. Response is one thing, lift can be quite another. Once this idea becomes fully embraced by the web analytics community, it’s going to be very disruptive. But using controls is standard procedure in the BI world, so trust me, it’s coming to web analytics. In Part 3, Akin flows it all together, providing sequential examples using the Attract & Acquire, Engage & Covert, Grow LifeTime Value metaphor. What does truly integrated (no silos) multichannel Marketing look like in practice? What do you do and how do you measure the results? Now we’re cutting waste and improving Marketing Productivity throughout the entire Customer LifeCycle. This section is notable for the use of case studies and detailed examples of what it looks like when you are actually maximizing value in an integrated way across all the touchpoints. What Marketing looks like as it morphs from the ancient offline calendar-based Campaign model into the “right person, at the right time, with the right message”, Measure Customers not Campaigns approach. This book is a significant addition to the knowledge base, particularly in the area of integrating Brand Measurement into the overall customer management picture. He also provides a fabulous aggregation of Brand Measurement research sources I found very useful. Notable brand new ideas that I’m not aware of seeing anywhere else are the Maturity of Multi-channel Profiles idea and the Cross-Channel Funnel Report. There are numerous other concepts that may not be brand new to the reader but are expressed in new or unique ways that are better than what has come before. Fantastic job, really. I’d call the book a must read, the kind of book I absolutely would not hesitate to hand to Senior Marketing folks and say, “Read this, it’s about where we are going”. As for the relevance of the picture below, see page 144 in Akin’s book! Ah! Friction! Haven’t you yourself taught us a lot about how to bring those customers into the house. Yep, a must read. Oh boy. I am much obliged for the detailed review, especially coming from Jim who has been innovating in this area for much longer than anybody else in our industry. You can’t think about cross-channel marketing too long before people in the know will point you to Jim’s work. Our fellow blogger Jaques (http://www.waomarketing.com/blog) is quite right. 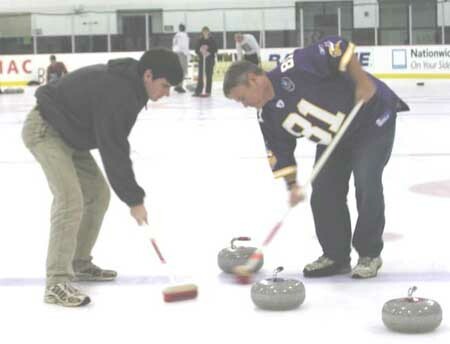 I borrowed the curling idea from Jim’s presentation at the eMetrics Marketing Optimization summit in 2006. It is such a good metaphor that by Fall 2007, while writing the chapter, I was confident it was my own idea 8-). Apologize for that. But so glad that we are all chiming in to bring more light to Jim’s witty metaphor. Once you cross the chasm between the various marketing disciplines and see what’s on the other side, it feels difficult to ever go back. I keep wondering now, why did I remain ignorant of this stuff for so long! Akin, there is no need to apologize for anything in your book! Let’s just leave it at we both came up with the same analogy, OK? Really. Web analytics hasn’t (yet) embraced the “customer” (i.e. the visitor) over “campaign” because *most* tools just can’t. They don’t store unsummarized visitor-level data or, if they do, they don’t provide it in an open, unified data model, or cost-efficient access to it in the hosted environ. In other words, *most* tools can’t even pinpoint customers, and if they can, chances are you can’t segment across all visitor attributes/dimensions or join the data with offline data. I hear what you’re saying, but I’m not sure that’s an excuse to not try to do it the right way! What confuses the hell out of me is how there could be all this “customer centric” talk around, yet people don’t even try to measure marketing at the customer level? If you can’t do it in web analytics, you find the system you can do it with. Clearly anybody remotely involved in commerce or subscription has the data somewhere. Why doesn’t this happen? 1. Not my job? That’s a hard one for me to swallow ;) An analysts’s job is to find the truth, and time is better spent chasing macro truths than micro truths. 2. Not clear on potential ROI? How about a simple e-mail test with control groups to prove this is an important idea? 3. Weak systems / resources? Man, if I can correlate web Campaign activity with customer behavior and value (and you know I’m not a programmer) then anybody can do it. Perhaps the community should tear this apart further? Q: If the customer is so damn important (centricity, experience, relevance, NPS, etc.) then why don’t you measure marketing success at the customer level? Well said! It is flabbergasting. Maybe marketers from different disciplines need to have more Margharitas with each other? We should start a cross-over Margharita sponsorship program. Maybe there aren’t enough Judah’s and Jim’s out there just yet who “get it”? Not enough examples and case studies? The tipping point is still ahead? There is something that makes me very hopeful though. The direct marketing conferences in the last 12 months have all included web analytics sessions or entire tracks (DMA / NCDM / ACCM). And the emetrics summit in SF included an integrated marketing track. The marketers haver started sniffing each other out! So far attendance in these cross-over sessions has been small. The topics have been introductory. But 24 months ago this was unheard of ! And, … i was told that the multichannel marketing book was the best seller at the emetric conference. OK, but it was also the newest book on the shelf. Great discussion – and congrats Akin on a great book. I have been in customer analytics for the past 15 years and I think Jim made an absolutely fantastic statement in one of his posts –” …an analyst’s job is to seek the truth….”. Couldn’t agree with that more. I have seen countless occasions when someone does an analysis not to find out what the customer is telling them but more to satisfy a ‘gap’ in their repertory of reports. As to lagging inertia vis-a-vis customer analytics and multi-channel marketing, my biggest challenge and opposition has been to make folks embrace the ROI from bringing channels together and leveraging the synthesized information in toto — at the unique customer level. Every Senior Officer across various channels (Customer Service, Brand Marketing, Direct Marketing, Online Marketing, Advertisement, Sales…etc.) is so focused on metrics tied to their MBOs for their channel that they don’t have the interest in looking at the ‘customer’. And you are right in that even though there are a lot of initiatives with customer in it (Customer Experience, Customer Contact Strategy, Customer Value etc. ), very few are really looking at the customer. My strength has been analytics in the ‘non-web’ world, and so areas like control groups, data mining, customer modeling, customer ltv, rfm etc. is nothing new to me. I am eons away from where you guys are (Jim/Akin/Judah) as far as web analytics is concerned — still an avid student :-). However, based on my humble experience I still totally support Jim’s argument that there is no excuse for not doing real customer anaytics — you don’t need a ‘customer 360’ infrastructure, or a Platform 5, or hifi VOC to kick-start your analytics. And you can always go the other way — instead of importing data into a common platform with Webanaltic data, one can take certain pieces of customer information from the web and mix it with relevant pieces from other channels. Anyway, didn’t mean to harp on this but I am a huge proponent of cross-channel analytics and customer analytics and it has been frustrating sometimes to sell the tremendous benefit from this. My mantra has always been ‘Unused information is worthless and, the more connections you can make across various customer ‘nodes’, the better you will understand your customer’. Thanks for the comment Ned, and agree on the “platform” issue. I know this will probably sound like crap to the IT-oriented folks out there, but sometimes you just have to grab what data you can where you can get it and see if you have the root of something worth talking about. Megan Burns’ presentation at the Summit on why these systems never get built – nobody can spec out the ROI – was kind of shocking to me. Why would anybody even think of building some kind of enormous “system” without a few proof of concept tests first? I can think of dozens of times I built this kind of stuff by hand in a spreadsheet – find the data, find a key, find some other data, find a key, line it up, what is happening, can we test it? I’ve even done this with log files (gasp!) using cookies and basket ID’s and so forth. This approach is not elegant for sure, and there’s no statistician that is going to bless it, but you really have to start somewhere, and skunkworks testing like this can help you build the case for some real investment. Find 100 cases, run a test, see what happens. That’s exactly what I did with this skunkworks effort. You can always beg forgiveness. Way to go Ned and Jim! Where there is a will there is a way. So it all starts with thought leaders like yourselves. Well, I can’t really pass up that softball, but not sure why you’re excluding yourself from the thought leaders, Akin! Ned, don’t you think the channel / communications model Akin provided in his book would help bring together the different factions? After all, it’s not so much that we want to *change* the metrics / MBOs for each faction, but to integrate them in a meaningful way, understand how one flows to another. Certain objectives, notably “Brand”, are simply what they are and have to be measured in less tangible ways. I usually find the root cause of this conflict to be there is no single, clear, Primary Objective, followed by a ranking of other Objectives. Just like when optimizing a web site. Each faction can have their own Objectives, but they must be linked in a tangible way to the Primary Objective. I think Akin’s model could really help people understand how to do this, don’t you? I love people who are worthy of accolades but are humble enough to not toot their own horn all the time — and you guys are definitely in that category [Of course, the corollary to that is I hate folks who think ‘they are the best’ even if they are really good :-) ]. Anyway Akin, on this one I got to agree with Jim. We are not suggesting that we throw out all the current metrics and create a new set of ‘multi-channel’ metrics. The key is to leverage what is in existence in each of the siloed world and then layer it with a sheet of uber-metrics (derived from the primary object as Jim puts it). So from the top we have a clear, integrated, and holistic view of the customer — and by drilling down we will get a tactical view of how the factions are doing. And Akin, this is where you come in and where your book will be extremely helpful. You provide a good framework for folks to understand the structural difference between the factions and possibilities on how they can integrate. Of course there can be no single solution to all problems — and this is another positive with this book. You teach them to how to fish (pardon the cliche) — and moving forward the readers can make improvements to their ‘fishing technique’ and customize to their fishing needs (vis-a-vis multichannel integration and marketing). Ahhh. it is moments like these that make me twice as grateful for having had the opportunity to study the subject and document the results in the book. Thanks guys! Agreed! Before anyone gets caught reinventing the wheel, why not start with what we know how to do first. Plus, the biggest shame is that the team members from these various groups within Marketing aren’t cooperating today. When I ask audiences how many talk to their counterparts between online and offline the hand raisers are still far too few. Email marketers could be a fertile group for cross polination. Often times these sit in the relationship marketing group but do talk to the web analytics people because of the inherent measurabilit of their activities. Alas, shame, because sending email is near free … they cannot resist the urge to spam instead of targeting their communications. Is it just me but I had really liked the idea that AOL was going to charge for delivering email to their customers. Too bad that didn’t fly. It might sound strange, but I have realized that ‘common sense’ is one of the most difficult concepts to grasp :-). To me it is a fundamental that folks in any area should have customer experience as their primary goal and then strive to perfect that goal for their channel — this will inevitably lead to cooperation with and leveraging what other channels has to offer in terms of ‘additional’ information about a customer. Currently as you said the cooperation between the factions is limited — mainly because the thinking is still ‘What “I” want to do for the customer (irrespective of whether it is really beneficial or asked for)” vs ‘What the customer wants’. Anyway, I think it is time Marketing stopped looking in the rear view mirror and instead start thinking proactively about future customer need scenarios. My opinion, the CMO should be the Chief Customer Officer and if CMO doesn’t step up, this more Strategic role of CCO will be taken from the CMO. Somebody has got to lead on this, the vacuum *will* be filled. You can come at it top-down or bottom-up. Top-down would be the appointment of a CCO that isn’t just a “coordinator” across silos, this person needs real power to force unified metrics on the factions. Bottom-up, the more likely and usually more painful scenario, is an analytical team that succeeds in *proving* there is financial damage being done by not having unified customer-based success metrics. This team would likely be working for the CFO or CEO. This frequently happens when companies are bought out or divisions merged, for example. Either way, the only way to measure Marketing and Service success is at the customer level, and you would think with all the “centricity” going on, people would simply gravitate to customer-based measurement. Interesting that you should mention this Jim — I have personally been involved in the approach you label ‘bottom-up’, and the customer analytics department did play a leading role. As you said it is ‘painful’, but to me the bigger frustration was that this approach generally takes time to take-off. The reason being not only did we have to come up with the concept, infrastructure plan, pilot, execution plan etc., but the most critical challenge was socializing it with the various factions to get buy-off that a single-view of customer is going to be beneficial to them (you would think this would be intuititve, however, you will be amazed at the convincing one has to do this regard). Having a CCO/CMO with a strong vision certainly helps in that because of the ‘power of influence’, folks atleast will give it a try :-). I like your CCO idea better because I think this person will need to have not only the Marketing savvy but also needs to understand the basic technical and analytical tenets that goes with with certain channels (like online). A CMO in my mind is a bit skewed towards the softer side of Marketing — not sure how much confidence a traditional CMO might be able to generate across channels — as confidence is a key to buy-off. The big question I have about all this customer centric stuff: are folks talking about one-to-one marketing on a individual customer basis or are we talking customer segment level or persona level? To add to your list of why we don’t do it / excuses we make. I’d also add 4) managerial understanding of the importance and potential lift to revenue/profitability, which points at yr #2 above. Not all companies have CMO’s or marketing staff who get this stuff. And companies certainly do not have Jim’s/Akin’s/Kevin’s running around who get it like you all do at the masterful, super deep level. And 5) organizational structure issues. It’s silos, silos, silos, fiefdoms, fiefdoms, fiefdoms in some companies. Even if the data is out there, to bring it together in some companies that lack the managerial alignment/imperative to do must be really tough for some folks! Not that these are excuses, just obstacles, that companies that want to go from “good to great” can overcome. Anyway, an excellent question you ask, and I hope to address on my blog at some point, some time, in the future! Judah, point well taken on the vendor situation, though I don’t think we need to wait for them. In many cases there is enough “data bleed” into other systems that you can get started. I fully expect that most if not all of the cross-silo discovery that needs to take place will be driven not by edict but at the hands of curious analysts. At some point, they will simply “have to know”! And then, they will approach management on #4 – look what we found, what can we try? Hopefully these analysts will have silo partners to help out with the execution. Sounds to me like this is the experience Ned had. Painful, slow, but ultimately satisfying. Or perhaps they will “just do it“. Re: segmentation / 1-2-1, on the Marketing side, for the most part you target at the segment level and execute at the individual level where possible through inline customization. In other words, the communication is delivered at the behavioral segment level but the content of that communication can be personalized. How deep you go with this is a matter of cost; you stop breaking macro segments into micro segments when the lift you get versus control no longer pays for the effort. In the longer run, I think people will realize that there is a best structure for moving all this forward: the “Center of Excellence” (COE) – where all the senior analysts play together, and the “Business SWAT Team” – the cross-silo execution arm of the COE. Focus and activities driven by the C-Level or (if you must) an EVP Steering Committee. May I suggest that this structure above is quite similar to what most great web teams look like now, applied to the entire corporation? Cross-functional analysis and execution. Harder with an entire company – but incredibly challenging and a lot of fun!